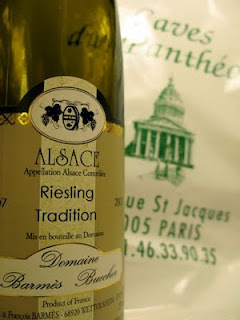 2007 Riesling Tradition, a strictly biodynamic wine by Geneviève and François Barmès. The scent contains candied lemon, almond from Valencia and a warm, buttery tone of toffee. The taste is dry and amazingly complete, with a dense fruitiness of apples, pears, ripe yellow prunes and grapefruit. The acidity is ripe and fresh, accompanied by a model minerality that gives a sense of absolute purity in the finish. A wine at a high level despite the modest classification. Price: € 11.